Things have been a bit crazy since I started taking classes a few weeks ago. It’s been 30 years since I had to worry about homework, studying and test taking. Getting acclimated has been stressful but exciting at the same time. It’s nice to have a sense of accomplishment and purpose but I”m still having a difficult time adhering to a schedule. Once the ritual sets in I’m sure things will smooth over. Cooking and finding time to post recipes have become more difficult especially since I took a quick trip to California last week. I took my son to a one-day. Basketball camp at Chapman University and got to see my family as well. We are embarking on a serious hunt for the perfect school, and it’s emotional to think that he will be going off to college in 18 months. The house will be still, quiet and most likely neater but I will miss our time together immensely. My son has been trying to get into peak physical condition for his upcoming basketball season, and he can’t tolerate dairy, so our meals consist primarily of meat and vegetables. He has no interest or desire to eat vegan except for his dessert, so I’m always trying to find dishes that will serve dual purposes. I’ll develop something around vegetables that I can top with some grilled chicken or fish. This salad is the perfect example. I love to eat it as is, but for Ben, I’ll add some grilled chicken to make him happy. 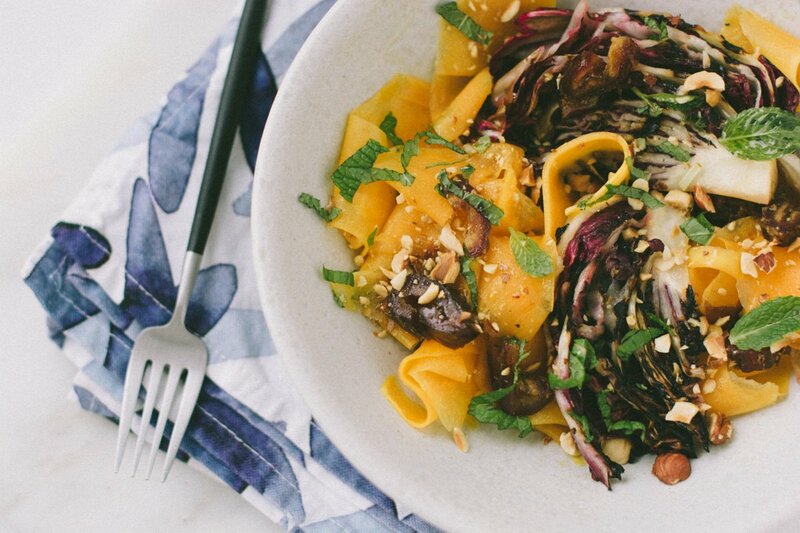 If you’ve never had raw butternut squash, you are in for a treat. 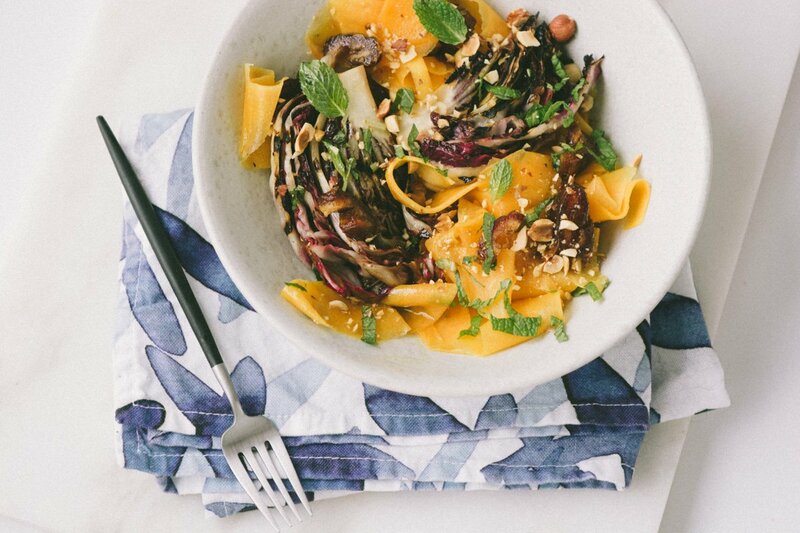 You could use a spiralizer if you have one but for this salad, I just used a simple vegetable peeler to slice paper-thin strips of squash that is tossed with a bright and tart Meyer lemon dressing. Grilling the radicchio imparts a lovely bitter smokiness that pairs really well with the squash. The dates enhance the sweetness but the radicchio brings everything into balance, and the fresh herbs are essential since it’s so simple. 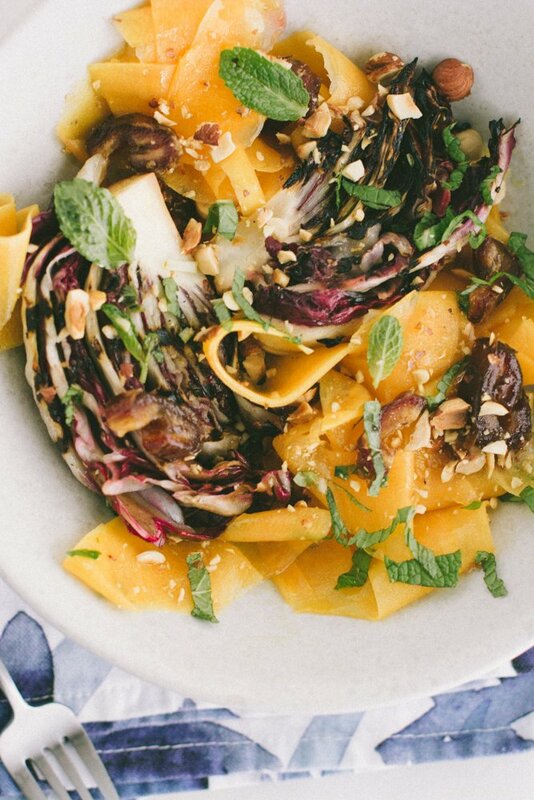 This shaved butternut squash salad is vegan, gluten-free and paleo friendly. You could also top it off with some grilled chicken or pork tenderloin, that’s how I make it teenage boy friendly. 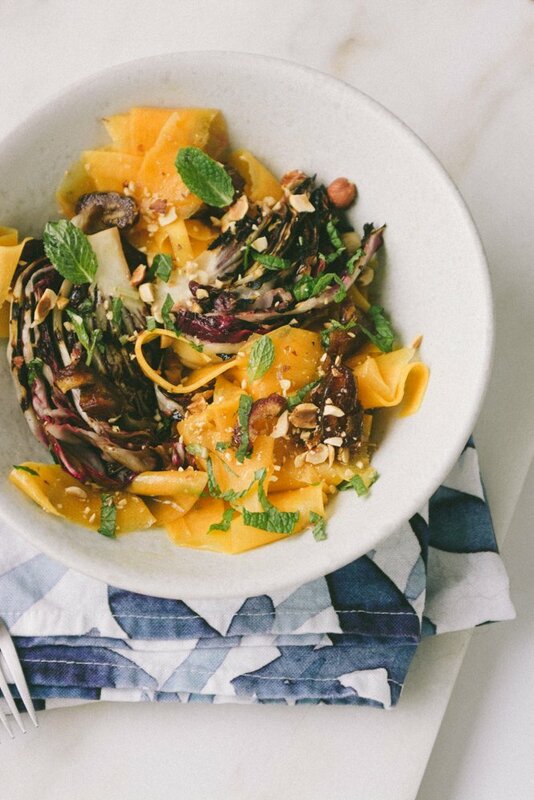 This shaved butternut radicchio salad with dates and hazelnuts is vegan, gluten-free and paleo-friendly. 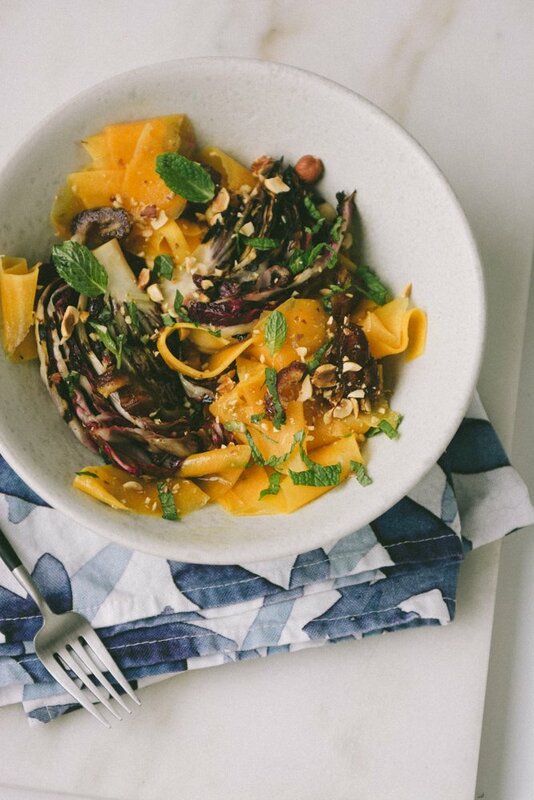 The bitterness of the radicchio is counterbalanced nicely with the sweetness of the butternut squash and the dates. 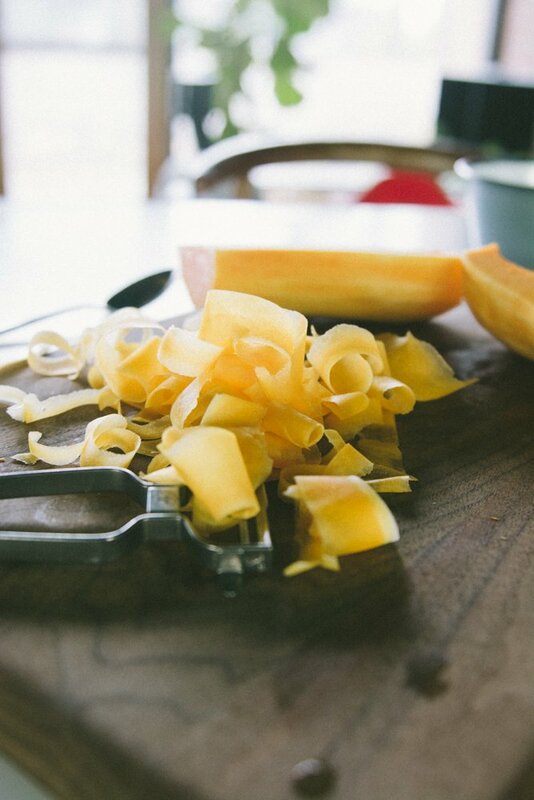 Using a vegetable peeler or mandoline shave the squash into thin ribbons and add to a mixing bowl, you should have about 6 cups. In a small bowl combine the olive oil, lemon juice, apple cider vinegar, honey, salt and pepper and still well to combine. Add two tablespoons of the vinaigrette to the shaved squash and toss lightly to coat. Heat a grill pan over medium-high heat and spray lightly with cooking spray or olive oil to prevent sticking. 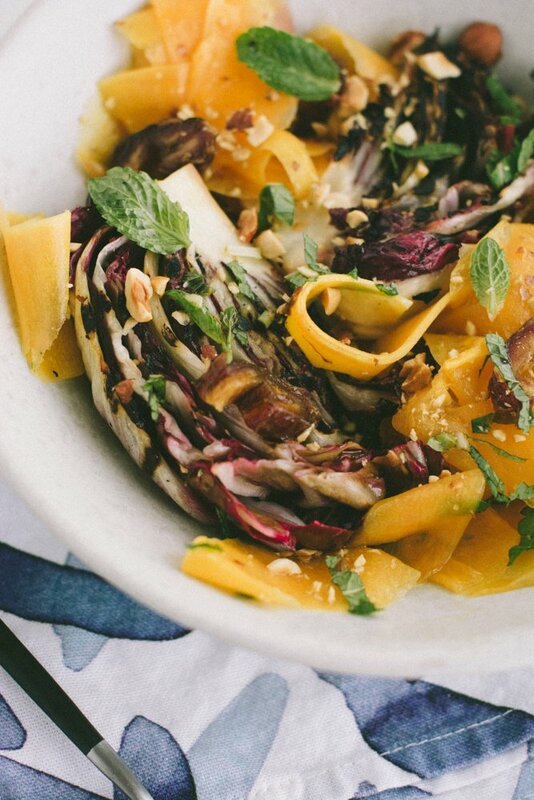 Add the radicchio to a bowl and toss with 2 tablespoons of the vinaigrette. Grill the radicchio for 2 minutes on each side or until the vegetables begin to wilt. 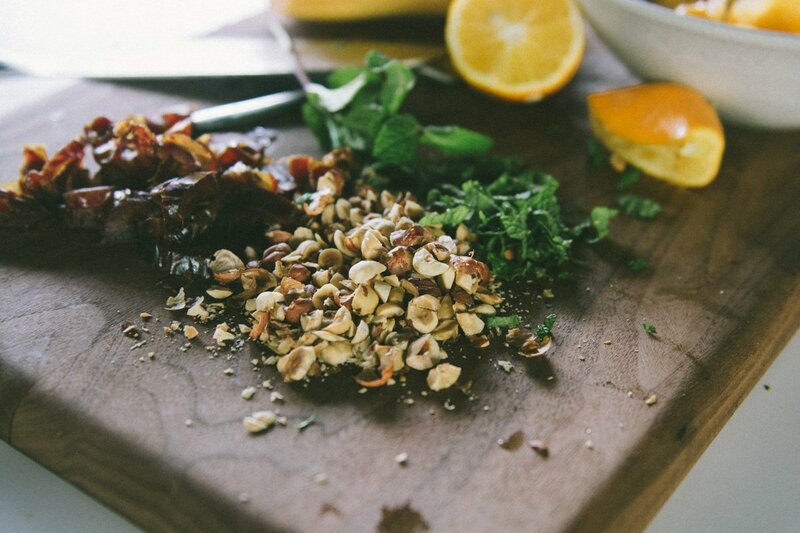 Combine the radicchio with the squash and add the chopped hazelnuts, dates and mint and toss gently to combine. Taste and add additional salt, pepper or lemon juice if desired. Hi! Did I miss honey in the recipe?